Open the Stamp Layer: Chose "Add New Layer" -> "Imagery" -> Make sure that "Image Sets" is selected and click "HiRISE DTM" OR Chose "Add New Layer" -> "Instrument" -> "HiRISE" -> "HiRISE DTM"
Enter Search Parameters: Since there are so few HiRISE DTM products currently available, the only necessary search parameters are Image ID and Latitude/Longitude. The allowable values for each field are given in the quick reference table below followed by more detailed descriptions of each search parameter. Perform Image Search: Clicking OK will make the Stamp Layer perform the search and display the results. Once the stamps are displayed in the Viewing Window, users can right-click on an outline to viewed a shaded relief of the DTM. 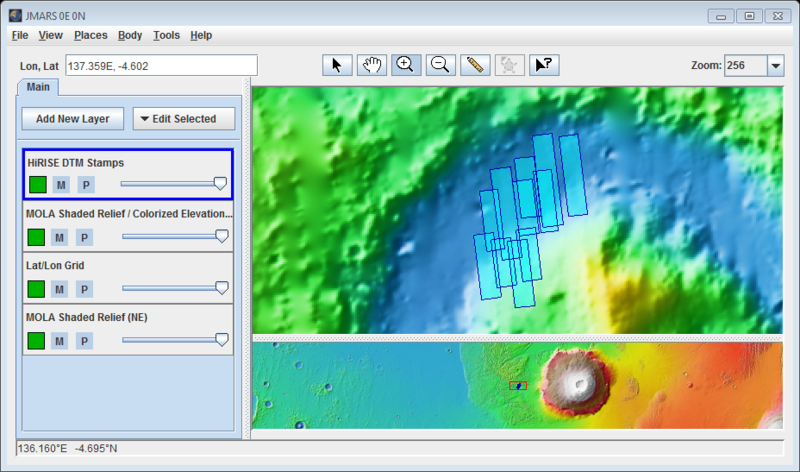 Users can also choose to view either of the images used to create the DTM by either rendering the images in JMARS or viewing the image in a web browser. This is the approximate longitude on the planet Mars of the image center. All values are based on the IAU 2000 aerocentric model of Mars with east positive longitude. 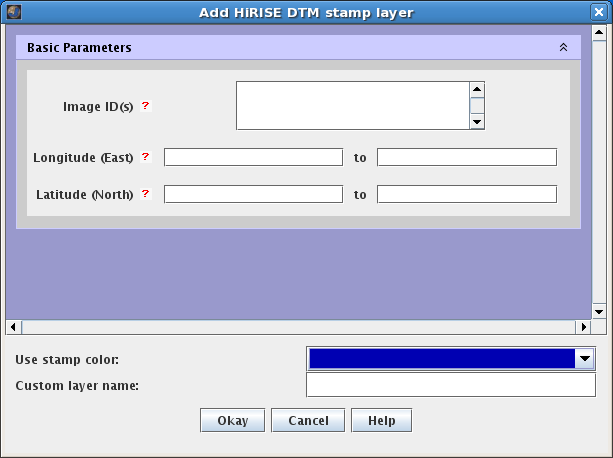 The HiRISE DTM Stamp Layer's functions are identical to the functions of the Stamp Layer and are explained in detail on the Stamp Layer page.